>SARO received this flier the other day and though it was a good concept, so we thought we’d pass it along to you. 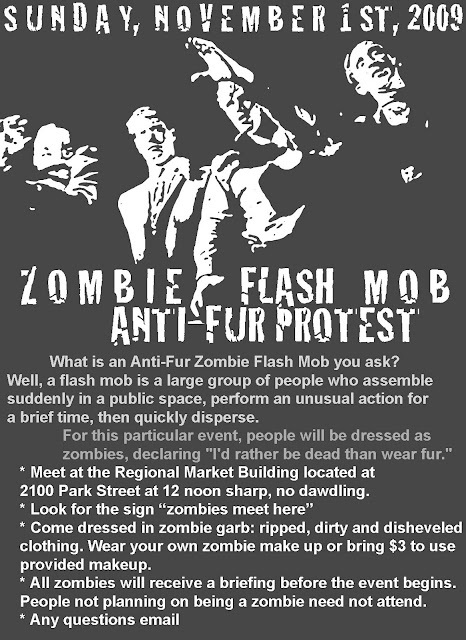 What is an Anti-Fur Zombie Flash Mob you ask? Well, a flash mob is a large group of people who assemble suddenly in a public space, perform an unusual action for a brief time, then quickly disperse. – Meet at the Regional Market Building located at 2100 Park Street at 12 noon sharp, no dawdling. – Come dressed in zombie garb: ripped, dirty and disheveled clothing. Wear your own zombie makeup or bring $3 to use provided makeup. – All zombies will receive a briefing before the event begins. – People not planning on being a zombie need not attend. Need some inspiration on being a zombie? Hulu is playing Dawn of the Dead until March 1, 2010 for free. This entry was posted in action alert, flash mob, fur, protest, syracuse, zombie on October 28, 2009 by saro.